You'll see me back here on January 2nd for the 2nd Annual No-Kiss blogfest hosted by the fabulous Frankie Diane. Yes, that's right. TWO DAYS EARLIER than planned! Look, I found the perfect scene and I just couldn't resist the siren song. I may be cheating SLIGHTLY but I think you will all appreciate the ROMANCE. I promise it is not even Mythology Related. Go sign up and let's DO THIS THING. Then pop back over here on January 4th for More Theseus. Yeah, I know. I'm incurable. Sorry. also, I apologize for all the caps in this blogpost. Regular posting will resume on January 4th! Possibly with less Theseus, though I'm making no promises. 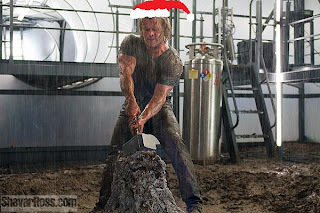 Special thanks to @trinza for this awesome Thor-with-Santa-hat, and also thanks to Mia for THE FOLLOWING image! 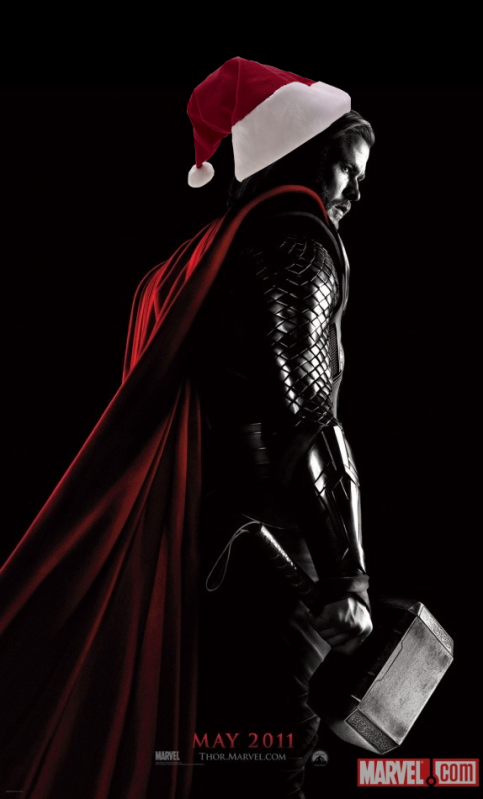 If by any chance you have a Thor-wearing-a-Santa-Hat image you'd like to share, leave a link in the comments and I will add it to this post! 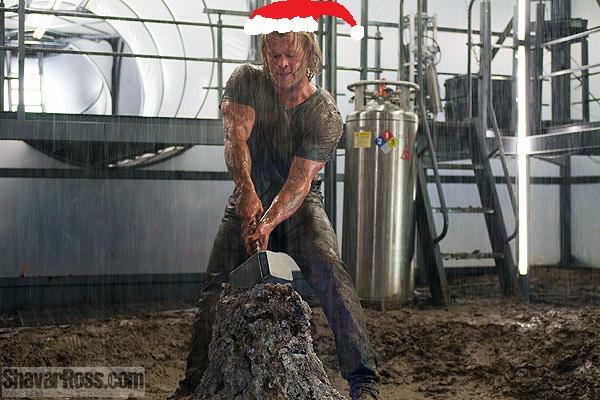 Just because he's Norse doesn't mean he can't enjoy some holiday cheer, right? Also acceptable: Theseus with a Santa Hat. Man, if I had really been on the ball, I would have come up with some kind of Thor-with-Santa-hat contest, but... I, uh, apparently did not think of it until right this second. SORRY. NEXT YEAR, GUYS! I will come up with something! In The Pericles Commission, Nico, the main character, wonders briefly why Theseus is not included among the statuary at the Monument of the Eponymous Heroes in Athens. Ever since I read it, I've been turning the problem over in my mind as well (a compliment to you, Gary Corby, because I love nothing better than a book which gives me something to chew on in regard to history and myth!). But I think I might have an idea which explains, at least in part, why. Of course it's all conjecture. It's always conjecture and educated guesswork. The reason Theseus was not among them might have been related to his return to Athens from the Underworld and subsequent dismissal. Theseus lost the flesh from the back of his thighs when he was ripped out of the chair of forgetfulness by Heracles, and therefore he would have returned to Athens no longer WHOLE. There is plenty of plenty of plenty of evidence for the Athenian admiration for the perfection of the human body, from art to athletics, and I imagine that this vision of their hero, their magnificent King, must have come as something of a shock. Theseus would no longer have been in the position to continue on as a warrior if he were recovering from a wound like that--unnatural to say the least, and no doubt jarring. My personal theory is that this is one reason why his people wanted nothing more to do with him as King by the time he got back-- we see it echoed later in Byzantium MUCH later, where members of the royal family who they never wanted back near the throne again had their noses cut off, because if they were not whole they could not RULE-- and so, perhaps it was this same rejection which knocked him out of the running for that series of statues. Not just because he couldn't rule, but also because his very appearance was an affront to Athenian sensibilities about beauty. Theseus might very well have been better off dying with honor than coming back to Athens so physically disgraced. Theseus vs The Minotaur. Again. Add to this that most of the imagery we have of Theseus revolves around his youthful adventures: his trip to Crete to battle the Minotaur, his capture of the Marathon Bull, MORE of Theseus slaying the Minotaur (seriously it is EVERYWHERE), Theseus battling along the six entrances to the Underworld, and you wonder if he was admired as a King at all. Even in modern art and discussion, we gloss over his adventures as an adult. Both Mary Renault and Margaret George completely disregard his abduction of Helen, while Rick Riordan implies that he did not live to old age when Theseus' shade appears to Percy Jackson as a youth. In fact the latter half of his life is just one long fall from grace so full of tragedy that it isn't really even all that heroic, completed with his death falling from a cliff. The only idea of Theseus as King we really have is the Sanctuary of Theseus in Athens, where slaves could flee to claim protection. This too, may not have made him a very popular King among the political elite, since it might have been construed as an upset to the status quo. Now, of course there could have been other reasons, and in fact the website I linked to above states that it was simply a decision made by an oracle after a larger list was submitted. BUT, I don't think anyone researching Athens can forget the political nature of, well, everything they did. I humbly submit after laying all of this evidence before you, that perhaps Theseus's exclusion had a lot to do with the fact that Athens really preferred to forget about the fact he was ever their king, not ONLY because of his disfigurement, but certainly as the final nail in his coffin. Ultimately, Athens had no use for a disgraced King, hero or not. Not when his father could do the job without the taint of dishonor and failure, certainly! I made it to Tessa's short list for the Blogontest! Now usually these kinds of things you can't really help me with, because they are random drawings and you all know that randomizer is not my friend, but TESSA is asking for you to vote. So please, read my contribution, and the others in the short list, and cast your vote for whichever you feel should win on Tessa's sidebar! You have until December 12th to cast your vote. In other news, I am back at the revision process with Helen, after taking November off for NaNoWriMo, and it is serious business. My goal is to have this round of revisions done by December 18th, which means that I have 22 pages to revise a day in order to get there, plus some additional writing since 2 out of 3 of my test readers tell me that the ending is too abrupt. Further handicapping me, el husband has this weekend off and we must finish our Christmas shopping. Dooooommmm! In the meantime, FEAST YOUR EYES on the newly released Thor movie poster! And forgive me for being a lame poster while I work through the second half of Helen. I don't usually write reviews, but since this novel is not just a novel, but also a love letter to Classical Athens, I feel in this instance you will all understand why I am COMPELLED to do so. And I know also that you'll forgive me for not being GOOD at writing them. Gary sifts through the dry details of history and raises to the surface all the fascinating anecdotes that turn academic reading into PEOPLE who we can identify with and root for. People who lived and walked the streets, with motivations we can understand, and struggling against the same things we do, today. And not only that, but people with a sense of humor too! The Pericles Commission follows Nico as he takes on an investigation that throws him into the political pool of Athens at the deep end before he really knows how to swim. I can't judge the quality of the mystery (this was the first mystery novel I've read, to be honest. I know, I know. I'm sorry! ), but I can tell you that I had no idea who the killer was until the end, and following the characters and their relationships while they figured it out (and struggled to keep their heads above water in the process) was fascinating and fun! If you have anyone mildly interested in Classical history in your family, do pick up The Pericles Commission for them this Christmas. *I don't think it's boring at all, personally, but that's because like Gary (I can say this with absolute confidence after reading his book even if I did not already know), I am devoted to it. The Napkin goes on the left. At age 26, I can't tell left from right when I'm driving, or faced with a fork in the road, but I will always, ALWAYS remember which side of the plate my napkin belongs on. I also know how to sew buttons, make pillows using old pantyhose for stuffing, and of course, how to paint. Grandma taught me how to doggy-paddle in the river, catch crayfish and clams, and row a boat. Grandma had me exercising my creativity painting her garden ornaments, and no matter how completely awful they looked when I was finished, she set them out for everyone to see in that place of honor by the front steps. Grandma always mended my stuffed animals when they needed it and unflinchingly fed me goulash at 4 in the morning to make sure I had eaten something before I got on a flight back home when I came to visit her in Florida. She didn't mind how many paper cups I used to set up crude lizard traps in her garden. Grandma ingrained in me the use of matching towel sets, even if my guests don't quite know what to do with them all. After a week with Grandma in the summer, I always had something to show for myself. Whether it was cookies that we had helped bake, cabinets we had organized to perfection, completed sewing projects, grass clipping around the old barn at Uncle Dave's, or paint and repair jobs, she always made sure we had done something we could take pride in and show off to Mom and Dad when they came to pick us up and have Sunday dinner. She taught us hard work, and aside from the grass clipping, it was always worth the rewards. Trips to Cole Park to go row-boating, swimming in the river, riding the wagon recklessly down the sidewalk, evenings spent playing ping pong and watching Nickelodeon in the basement, or roasting marshmallows outside at the fireplace. And of course that cup of hot chocolate before bed— half a packet of mix, each—and the classic toasted cheese sandwich (hopefully without the plastic). Napkin on the left with the dinner and salad fork on top, spoon and knife on the right. Make sure that there's ice in everyone's glass. But more importantly, family. Gathered together, sharing a meal, and spending time with one another. Grandma taught us the most important things, and I will always remember.